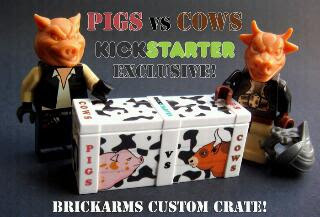 This is a great Kickstarter project for LEGO fans.
" 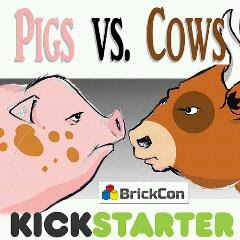 I am SOOO happy to welcome you to the PIgs vs Cows project!This year's theme for BrickCon 2013 - the greatest LEGO fan event in the world - is going to be Pigs vs. Cows! Wild, crazy, wacky and fun what could make it an even better theme?How about professionally crafted, and beautifully produced custom Pig and Cow character heads for your Miniature Figures? That's what I have created for you!" Its a fun looking project and the pieces look great. MiniBIGS is signing on for some!